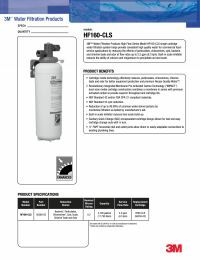 The 3M HF60-CLS chloramine reduction system helps provide consistent high quality water for commercial foodservice applications by reducing the effects of particulates, chloramines, cysts, bacteria, chlorine, taste and odor. The HF60-CLS has a built-in scale inhibitor that reduces the ability of calcium and magnesium to precipitate as lime scale. Revolutionary Integrated Membrane Pre-Activated Carbon Technology (IMPACT) dual-zone media cartridge construction combines a membrane in series with premium activated carbon to provide superior throughput and cartridge life. Reduction of sediment and abrasive hard particles helps prevent equipment wear and helps extend the life of pumps, valves, orings and seals. 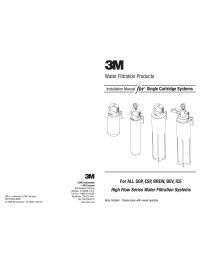 3M Water Filtration Products is formerly known as CUNO Incorporated. CUNO Incorporated was previously divided into CUNO Food Service, Aqua-Pure, and CUNO OCS.